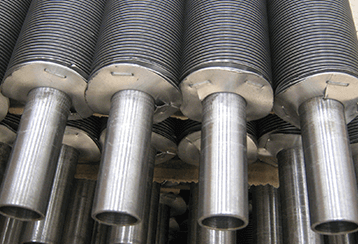 Fin Tubes ( Finned Tubes ) are mainly Heat Exchanger tubes used to transfer the process heat. The Finned Tubes are essentially Tubes with increased surface area. The amount of heat tranfered from a particular surface is directly correlated to the surface area available for the heat to transfer . Hence , increasing the heat transfer area as a whole increases the heat transfer efficiency. In a Finned Tube the Surface Area of the Tubes is increased by providing Fins on the Heat Exchanger Ares . These fins can be of various types , made of various materials and designed in various ways depending on the end requirement. HIGH FREQUNECY WELDED FIN TUBE. You can rest assured for getting the best solution and best type of Finned Tubes at Anand Seamless Tubes Pvt LTd.